Representative Beverly Earle, District 101 in Mecklenburg County Celebrates PACE Month! 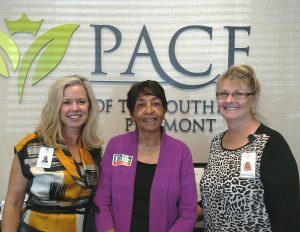 Representative Beverly Earle, District 101 in Mecklenburg County, visited PACE of the Southern Piedmont during their PACE Month Open House on Wednesday September 27,2017. As a member of the Joint Legislative Oversight Committee on Health and Human Services for North Carolina, representative Earle has taken a great interest in the PACE Model of Care. After a tour of our Day Health and Wellness Center and Medical Clinic, Representative Earle was eager to begin working on the advocacy and expansion for PACE. She explained how PACE is the future of home and community based healthcare, and that she wants to see it expanded to every County in North Carolina. Before leaving the PACE Month Open House, Representative Earle extended an invitation to speak with all of the members of the Joint Legislative Oversight Committee on Health and Human Services about the PACE Model of Care and the benefits it provides. With the help of CEO and Executive Director of PACE of the Southern Piedmont, Renee Rizzuti, and the NC PACE Association, a time to present before the committee will be coordinated in the near future.